user warning: Table './active5_foxes/cache_filter' is marked as crashed and should be repaired query: SELECT data, created, headers, expire, serialized FROM cache_filter WHERE cid = '2:7c67e132d280d88bdd13f56722ea709e' in /home/active5/public_html/drupal6_multisite/includes/cache.inc on line 25.
user warning: Table './active5_foxes/cache_filter' is marked as crashed and should be repaired query: UPDATE cache_filter SET data = '<p class=\"rtecenter\"><img alt=\"\" src=\"http://www.catchingfoxes.com/sites/www.catchingfoxes.com/files/resize/blog/Bridge%20with%20Title-350x415.jpg\" style=\"width: 350px; height: 415px; border-width: 5px; border-style: solid; margin: 10px;\" title=\"\" width=\"350\" height=\"415\" /></p>\n<p>We had the opportunity this fall to visit the Menominee Indian Reservation in Wisconsin with a group of volunteers. We spent a Saturday cutting firewood for the tribe&#39;s senior citizens. As our group processed what it meant to be invited onto the reservation, we were challenged to think of ourselves as bridge builders from one culture group to another, and then further <strong>challenged to think of tangible things we could do to build bridges.</strong></p>\n<p>Our list, written on wood, became an actual bridge of<strong> simple things that establishes and deepens relationships.</strong></p>\n<p>A bridge builder:</p>\n<ul>\n<li>\n	Listens</li>\n<li>\n	Has honest hard conversations graciously</li>\n<li>\n	Smiles</li>\n<li>\n	Ask questions</li>\n<li>\n	Forgives</li>\n<li>\n	Persevere</li>\n<li>\n	Shares meals and times of fellowship</li>\n<li>\n	Is willing to help in practical ways</li>\n<li>\n	Opens home and frees schedule</li>\n<li>\n	Seeks to find points of connection</li>\n<li>\n	Asks for help so relationship is a mutual give and take</li>\n<li>\n	Is authentic</li>\n<li>\n	Prays for the other individual</li>\n<li>\n	Demonstrates reliability</li>\n</ul>\n<p>Our group focused on building a bridge from one people group to another. But looking at the bridge we made, I couldn&#39;t help think of how often we desperately need to build bridges to one another in our homes.</p>\n<p>Wife to husband. Husband to wife. Parent to child.</p>\n<p>I realized that often in the middle of a conflict in my own home, the last thing I do is smile or ask questions or try to find points of connection.</p>\n<p><strong>The stress of daily living and sin can weaken the relationships that connect us. We have to purpose to restore deteriorating bridges before they collapse. </strong>What can you do today to build a bridge to someone in your family?</p>\n<hr />\n<p>Fox Catcher: 2 Corinthians 5:18-19</p>\n', created = 1555819865, expire = 1555906265, headers = '', serialized = 0 WHERE cid = '2:7c67e132d280d88bdd13f56722ea709e' in /home/active5/public_html/drupal6_multisite/includes/cache.inc on line 108.
user warning: Table './active5_foxes/cache_filter' is marked as crashed and should be repaired query: UPDATE cache_filter SET data = '<p class=\"rtecenter\" style=\"\"><a href=\"http://www.facebook.com/CatchingFoxes\" target=\"_blank\"><img alt=\"\" src=\"/sites/www.catchingfoxes.com/files/resize/social/facebook-64x64.png\" style=\"text-align: center; width: 64px; height: 64px; \" width=\"64\" height=\"64\" /></a><a href=\"http://pinterest.com/kimmrankin/\" target=\"_blank\"><img alt=\"\" src=\"/sites/www.catchingfoxes.com/files/resize/social/big-p-button-64x64.png\" style=\"width: 64px; height: 64px; \" width=\"64\" height=\"64\" /></a><a href=\"mailto:kim@catchingfoxes.com\" target=\"_blank\"><img alt=\"\" src=\"/sites/www.catchingfoxes.com/files/resize/social/mail-64x64.png\" style=\"width: 64px; height: 64px; \" width=\"64\" height=\"64\" /></a><a href=\"http://www.catchingfoxes.com/rss.xml\" target=\"_blank\"><img alt=\"\" src=\"/sites/www.catchingfoxes.com/files/resize/social/rss-64x64.png\" style=\"width: 64px; height: 64px; \" width=\"64\" height=\"64\" /></a></p>\n', created = 1555819865, expire = 1555906265, headers = '', serialized = 0 WHERE cid = '2:48be9f28bc948ea32b70445d0a590c98' in /home/active5/public_html/drupal6_multisite/includes/cache.inc on line 108.
user warning: Table './active5_foxes/cache_filter' is marked as crashed and should be repaired query: UPDATE cache_filter SET data = '<div class=\"fb-like\" data-font=\"verdana\" data-href=\"http://www.facebook.com/CatchingFoxes\" data-send=\"false\" data-show-faces=\"true\" data-width=\"280\">\n	&nbsp;</div>\n', created = 1555819865, expire = 1555906265, headers = '', serialized = 0 WHERE cid = '2:854065b9b61ff8596c8fa62e384317c7' in /home/active5/public_html/drupal6_multisite/includes/cache.inc on line 108.
user warning: Table './active5_foxes/cache_filter' is marked as crashed and should be repaired query: UPDATE cache_filter SET data = '<p><strong>Catch for us the foxes, the little foxes that ruin the vineyards, our vineyards that are in bloom. </strong><br /><em>Song of Solomon 2:15 NIV</em></p>\n<p>Metaphorically, the &quot;foxes&quot; are the damaging attitudes and actions that can creep in and threaten the love relationship of a couple and a home. &nbsp;Catching Foxes is committed to being a resource as you guard against the things that might injure and destroy the harvest you are striving to grow in your home.</p>\n', created = 1555819865, expire = 1555906265, headers = '', serialized = 0 WHERE cid = '2:132a8457abcc78748ef29251eaa8f1d7' in /home/active5/public_html/drupal6_multisite/includes/cache.inc on line 108.
user warning: Table './active5_foxes/cache_filter' is marked as crashed and should be repaired query: UPDATE cache_filter SET data = '<p><a href=\"mailto:kim@catchingfoxes.com\">kim@catchingfoxes.com</a></p>\n', created = 1555819865, expire = 1555906265, headers = '', serialized = 0 WHERE cid = '2:fe7b2055d10a2c25c439ca4710d86502' in /home/active5/public_html/drupal6_multisite/includes/cache.inc on line 108. We had the opportunity this fall to visit the Menominee Indian Reservation in Wisconsin with a group of volunteers. We spent a Saturday cutting firewood for the tribe's senior citizens. As our group processed what it meant to be invited onto the reservation, we were challenged to think of ourselves as bridge builders from one culture group to another, and then further challenged to think of tangible things we could do to build bridges. Our list, written on wood, became an actual bridge of simple things that establishes and deepens relationships. Our group focused on building a bridge from one people group to another. But looking at the bridge we made, I couldn't help think of how often we desperately need to build bridges to one another in our homes. Wife to husband. Husband to wife. Parent to child. I realized that often in the middle of a conflict in my own home, the last thing I do is smile or ask questions or try to find points of connection. The stress of daily living and sin can weaken the relationships that connect us. We have to purpose to restore deteriorating bridges before they collapse. 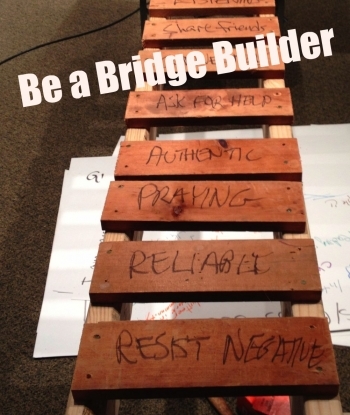 What can you do today to build a bridge to someone in your family?